Fifty marketers share strategies for targeting the right keywords, improving your rankings, and the tactics for outranking the competition. Targeting the right keywords isn’t easy. In fact, as we found out this week, it’s really complicated. There’s a nearly even split between high search volume and relevance, and a few others are close behind. Despite differences in opinion on which factors are the most important in keyword research, we did get some consistency. It’s clear that marketers are concerned about keywords and rankings. But there’s a lot of nuance in how they go about identifying the right keywords. Here’s a breakdown of what we learned. One of the most common things that marketers brought up was starting your keyword research by taking a look at your competitors. “Your top competitors already have what you want—rankings,” said Kyle Menchaca, SEO manager at WorkWave. Write a more thorough response to the search query or run a backlink campaign to get valuable links to your site. “In other words, target keywords you can realistically rank for, then make your content deserving of those rankings,” says Hornyak. Christine Kilbride, SEO associate at Majux Marketing, recommends figuring out what your competitors are missing. “Try to find content gaps,” Kilbride says. If you can address the questions that your competitors aren’t talking about, you’ll capture traffic that they can’t. Besides targeting your competition based on the keywords they’re already ranking for, though, it’s important to think realistically. TechJunkie founder Evan Gower shared some words of caution. He doesn’t usually try to take keywords away from the biggest competitors in his space, as they’re likely very entrenched. Find out which long-tail keywords your closest competitors are ranking for. Analyze the competitiveness of those keywords, including the pages’ backlinks. Create better content than your competition. Optimize that content for search engines. Reverse-engineer your competition’s backlink strategy. It’s not an easy process. But it will help you boost your rankings with competitor research. A final interesting note: Casey Bryan, founder of Grand Cru Digital, points out that you should research both on desktop and mobile search. You may find some interesting differences. As Evan Gower pointed out above, you can’t target every competitor and every keyword. You’ll need to prioritize based on which keywords you can reasonably expect to rank for. How do you know which competitors are worth taking on? Nectafy‘s director of operations, Henry O’Loughlin, recommends using the MozBar Chrome extension to see your domain authority. Dave Hermansen, co-founder of Store Coach, encourages marketers to see if major brands like Amazon and Walmart dominate the search results for their keywords. If they do, you may find it difficult to compete. Once you’ve positioned yourself on these results pages, you might have a shot at competing with major brands for your keywords. Marketers love tools. And when it comes to keyword research, there’s no shortage of great tools out there. Navigate to Site Explorer and enter your competitor’s URL. Use the Position dropdown to enter “From 1–10” to see which keywords rank on the first page. Use the KD dropdown to select entering “From 1–10” (this shows you keywords where the number of backlinks required to rank is low). This will help you find the best keywords to target for taking on your competition. Google Ads’ Keyword Planner was another tool mentioned a few times. Stacy Caprio, search marketing manager at Case Covering, has found other tools to provide inaccurate data, while Keyword Planner has produced reliable results. And sometimes it’s best to just keep it simple. Author’s note: this is my favorite keyword research tool as well. Great suggestion, Sarah! A few marketers recommend using Google Trends for your keyword research. “No keyword research strategy is complete without determining the potential and longevity of a selected keyword,” said Stuart Ridge, chief marketing officer of VitaMedica. He suggests using Google Trends to ensure that your keywords’ volume is increasing, instead of decreasing, and to capitalize on trending topics and keywords. The site can also be instructive in highlighting seasonal trends, he says. Ashleigh Peregoy, marketing magician at Box Marketing, also suggests using Google Trends for ads. Every Google search gives you additional information beyond your results. Freelance website optimizer Matthew Post recommends using the “People Also Ask” and “Related Searches” fields to expand your list of keywords. These are the things that people care about and are searching for, so they’re valuable resources. Another useful resource is Google’s search suggestions that are displayed when you’re typing your search query. These suggestions are updated every two to three weeks, says Kim Smith, content consultant at GoodFirms. These long-tail keywords are called “latent semantic indexing” keywords, says George Schildge, CEO of Matrix Marketing Group. And they’re an important part of Google’s algorithm. While Google is the gold standard in the SEO world, there are, in fact, other places to get keyword ideas. Aneesh Babu, founder of Backlinkminds, recommends Reddit and Quora. Srajan Mishra, CEO of TSI Apparel, also suggests Reddit and relevant forums. BBazaar‘s Ramesh Singh adds AnswerThePublic to the list. Trailblaze Marketing‘s search engine marketing lead Brian Schofield also suggests using Amazon for ecommerce keyword research. By entering your primary term and looking at the most common searches, you can get information on primary, secondary, semantically related, and other kinds of terms. When you’re researching keywords, one of the first pieces of information you probably look at is search volume. If a keyword gets a lot of searches, it seems like a valuable one. So you should target it. Right? Not so fast, said some of our respondents. You’ll be facing tough competition on many of those keywords. He also made sure to point out that you should be targeting keywords for which your site matches the search intent. If you’re not answering readers’ questions, it doesn’t matter how weak the competition is. You’re not going to do well. You can also take your current keyword rankings into account when you’re planning your SEO strategy. Syed Irfan Ajmal, growth marketing manager at Ridester, recommends prioritizing keywords that you’re already ranking for. Imagine you’re ranked 100th for a keyword that gets 5,000 searches per month, he says. And 5th for a keyword that gets 1,000 per month. He recommends emphasizing the second keyword, even if it’s quite difficult to improve your rankings. Assuming they both have the same ROI, that is. He points out the value of using words like “review,” “buy,” “purchase,” and “vs” to capture high-buying-intent leads. These are the words that people use when they’re considering buying. Prathamesh Yeotekar, SEO specialist at Valasys Business Solution, recommends looking for words with low search volume yet very high CPC. Of course, if you target keywords with high CPC, you’re likely to face significant competition for ranking. It’s going to be a battle—but if you win, you’ll get a lot of high-converting traffic. While niching down is a well-known business tactic, it works just as well when you’re selecting keywords to target with your SEO campaign. It’s especially crucial when you’re just starting out. “Keyword research can be sometimes daunting, especially if you see your competitors ranking high for a specific term or words,” says Ulysis Cababan, SEO specialist at RapidVisa. He suggests finding the niche keywords and verticals for targeting your target audience. As you build up your SEO program and start to establish yourself in the search ranks, you might be able to expand. But be sure to start with the targeted, long-tail keywords that people looking for your product might use. These keywords might get you less traffic, he says, but your visitors will be interested in your services. It’s tempting to jump right in and start picking keywords to target. But there’s more to it than that. You need a plan first. “The very first keyword research to be done,” says Casper Kraken, founder of Bureau Kraken, is determining “the number one topic you want your business to be known for.” It’s part keyword research, part branding. But it’s essential for a good SEO strategy. Dakota Williams, SEO specialist at Postali, uses an Excel file to track and plan her keywords. She keeps a list of each keyword, the corresponding search volume and competition, and the category. In addition to making it easier to track your strategy and successes, Williams says, this document can be useful to show to a client. If they question your strategy, you have the data to back up your decisions. Updated volume and competition data also lets you know when you should change your keyword strategy. It’s low-tech . . . but it works. And when you’re planning, be sure to take your customer personas into account. “[I]t helps to put a name and a face to the quest for the perfect words of intent,” says Carl Donovan, co-founder of Opus Marketplace. 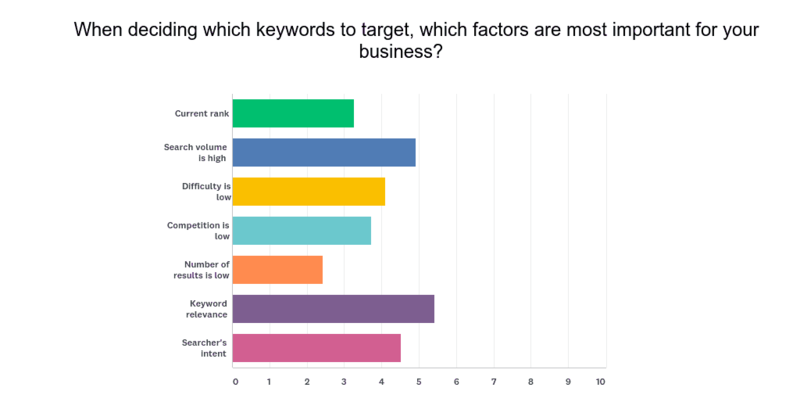 After sifting through the many responses to our survey, it’s clear that every company needs to develop their own keyword research strategy. There are many tips that apply to just about everyone—but we also saw plenty that apply to specific types of companies. For example, Online Optimism‘s SEO/SEM specialist Cory Sarrett suggested focusing on keywords that you already rank for (if you’ve already started producing content or even building a site). Robert Donnell, founder of P5 Marketing, recommends using cornerstone and pillar content to build a stable of related keywords that you target. This, of course, applies primarily to companies who are going to be creating a solid amount of content. Internet marketing specialist Derek Hines focuses on local keywords for West Coast Self-Storage. He recommends getting down to your specific ZIP code. As you can see, there are a huge number of factors to take into consideration. And every company will develop their own strategy for choosing and targeting them. But with this extensive list of ideas, you’ll now be better prepared to choose the right keywords for your organization. 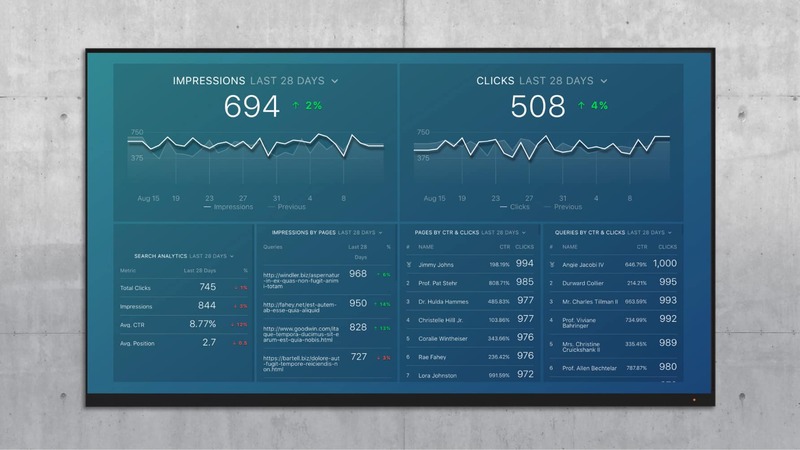 If you want to track your improvement in organic traffic, use this free Google Search Console dashboard to monitor the impact of backlinks. How do you find keyword ideas? What are your favorite tools and strategies? Share them in the comments below so we can chat about them.